All the bits are the same, regardless of the source. Licensing is where things differ. You may encounter the unfortunate "Unable to Complete Your Request We cannot complete your request at this time. We are working to resolve the issue as soon as possible" error..
once you choose 5.5 in the drop down menu, you get to the same place however. then fill out the form, which it confirms. Not sure when those requests will get filled. “Thank you for registering” confirms your request, note the indications that it’s 5.5. If the above links all fail, and you just want a piece of the new code, there is one link that works fine, the vSphere Client public download URL that requires no authentication. Explanation and screenshots right on TinkerTry.com, over here. 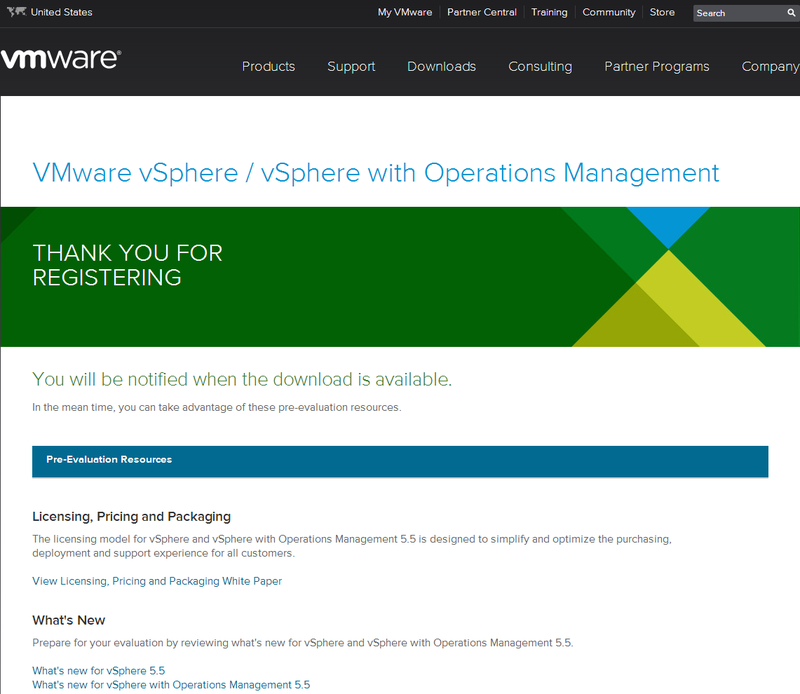 Sep 20 2013 02:37am ET - The download URLs for VMware vSphere Hypervisor (ESXi) have gone live! RTM (Release to Manufacture), GA (Generally Available), whatever you want to call it. So the release is apparently happening, despite no new press release, so far. Sep 20 2013 12:42pm ET - The first obviously 5.5 related URL below no longer shows a drop down menu for 5.5, reverting to 5.1 as the latest available. This is a step backward from earlier today, so apparently VMware just isn't quite ready yet. Follow @tinkererguy on Twitter and I'll do my best to notify you, once I've achieved download success, although I will be on a plane to Indianapolis shortly. All information that appears below is subject to change at any time, to give you the latest links that work. Please visit again later for the latest info, or follow @tinkererguy to get alerted to updated info. Ladies and gentlemen... Start your emgines! Its working... YAY!!!! which means my recent YouTube video about 62TB virtual drives was of the RTM code.